Definition at line 9 of file CREReportDefinitionManager.h. Definition at line 4 of file CREReportDefinitionManager.cpp. Definition at line 8 of file CREReportDefinitionManager.cpp. Definition at line 13 of file CREReportDefinitionManager.cpp. Definition at line 18 of file CREReportDefinitionManager.cpp. Referenced by CREReportDefinitionManager(), and CRESettings::loadReports(). Definition at line 29 of file CREReportDefinitionManager.cpp. Referenced by copy(), CREReportDialog::currentRowChanged(), CREReportDialog::onAdd(), CREReportDialog::onDelete(), operator<<(), operator>>(), CREReportDialog::refreshList(), CREReportDialog::saveCurrentReport(), and CREResourcesWindow::updateReports(). Definition at line 34 of file CREReportDefinitionManager.cpp. Definition at line 24 of file CREReportDefinitionManager.h. 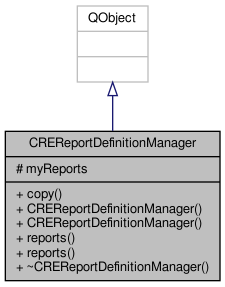 Referenced by copy(), reports(), and ~CREReportDefinitionManager().